As we “spring ahead” into a new season, changes will begin taking shape in the coming months at Lehigh Valley Hospital–Hazleton. Modernized and patient-friendly changes that will soon grace the interior and exterior of our community hospital. Construction is expected to begin on the hospital in the next few months, along with new construction at the Health & Wellness Center at Hazleton and expansion of services at West Broad Street. Renovations to the main entrance area will provide a more defined arrival point for patient drop-off and visitor entry, as well as additional nearby parking and an expanded lobby. A dedicated emergency room entrance will provide ease-ofaccess for patients, as will the addition of three ambulance bays for emergency transport arrivals. Hallways and other common areas will be upgraded with features like wayfinding signage and a soothing color palette. Double patient rooms will be transitioned to single rooms for increased patient privacy and will be enhanced with calming colors. 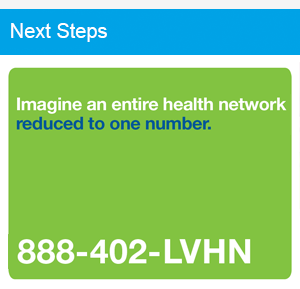 Visit LVHN.org/hazleton for more information about amenities and services offered at Lehigh Valley Hospital--Hazleton.